With the crazy busy-ness Mr. P and I have going on right now – working full days on the weekends? sure! three presentations and two grant proposals in three weeks? why not! all in the middle of traveling and hosting travelers? hey, we like a challenge – meals are getting super simplified around here. So if you’re looking for elaborate three-course meal ideas, sorry. You are in the wrong place. You’ve actually always been in the wrong place for that. But especially so nowadays! I still meal-plan every week, but my plans are less complex and more along the lines of “tacos” or “pasta”. That’s not necessarily a bad thing, as we like both of those things a lot. 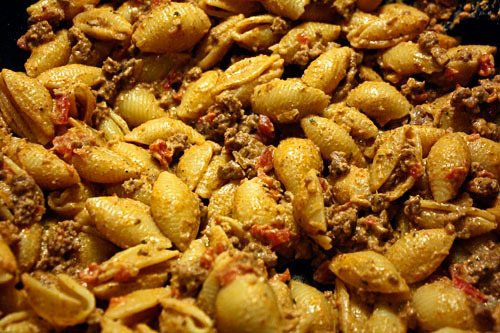 Which is why this recipe for taco pasta caught my eye. It’s no harder than making tacos or pasta, and it’s our two favorite standby meals, combined in one big pot of delicious comfort food! You start with a pound of pasta (more than the original source says – don’t worry, the sauce stretches). I think pasta shape selection for taco pasta is obvious, yes? While the pasta is cooking, brown one pound of ground beef. 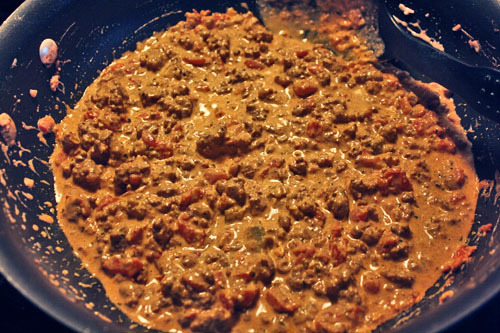 Once it’s cooked, add some minced garlic and onion, a can of rotel tomatoes, and a packet of taco seasoning. Somehow taco seasoning didn’t make that week’s shopping list, so I instead added chili powder, garlic powder, cumin, cayenne, black pepper, salt, dried cilantro, and whatever else seemed taco-seasoning-y from my pantry. A packet would be easier, of course, so try not to sleepwalk through the grocery store like me. 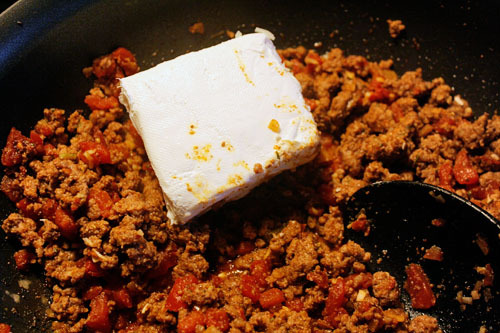 Why do recipes (like the source) so often use 3 ounces of cream cheese? Is that a normal package unit in other parts of the world? Around here it’s sold in 8 ounce packages, and having five-eighths of a packet leftover just seems silly to me. Anyway, throw in a half-cup of sour cream, too. 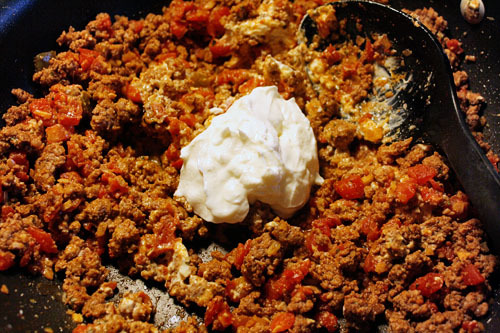 I failed to get more sour cream from the store, in addition to the missing taco seasoning (it was an off week..., no, month) so I just threw in what sour cream I had. Still delicious! 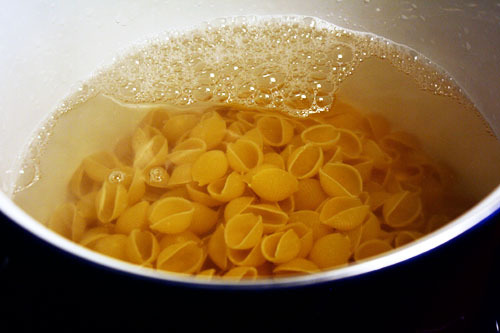 Finally, draw out a bit of the pasta water and add it to the sauce, to make it all melty and delicious! Once the shells are cooked, drain them and throw them in the pan, too. And ta-da, dinnertime! Sure, this dish is just a step up from Hamburger Helper. But will you just look at how cheesy and comforting this is? 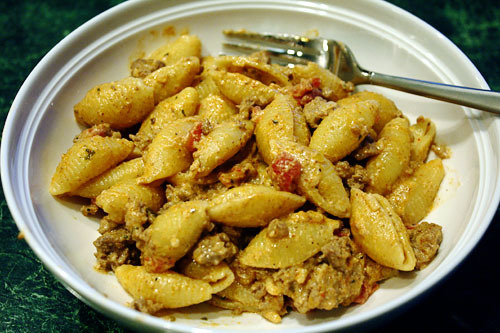 It’s a break from the usual pasta dishes, it’s simple, and it’s inexpensive, too. 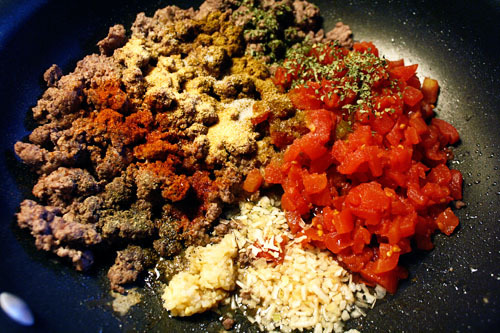 The seasoning is easily customizable if you don’t go with the pre-made packet of taco seasoning. And even if you do, you can stir-in shredded taco cheese, olives, beans chopped jalapeno... whatever you love in your tacos. In short: I loved this and I seriously want to make it every week now. Go forth and love it throughout the fall season with me, why don’t you? Enjoy!